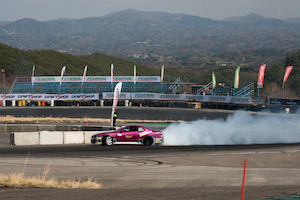 Ebisu Circuit’s legendary Minami course would play host to drivers travelling from around the world for Round 4 of the Federal Tyres King of Nations series alongside Round 2 of the King of Asia series. The infamous blind jump, followed by the concrete wall is known throughout the drifting world as the ultimate test for drivers and undoubtedly the most challenging track on the calendar. A dry practice session in the chilly yet sunny Fukushima mountains would provide drivers with the opportunity to lay down their best laps on the course which leaves absolutely no margin for even the slightest of errors. As always with trying to push the boundaries in the ultimate test, upsets happen. Several drivers were left with having to carry out extensive repairs to their cars during the practice sessions after falling victim. 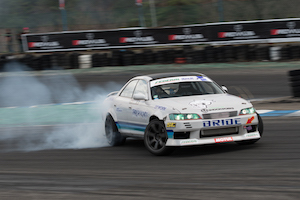 Even Naoki Nakamura was keen to learn the limits of his new S15 build which was landing the jump for the first time, and in his eagerness to clinch the top spot which he so nearly achieved last weekend, he learned the limits of the new car the hard way. As qualification got underway, Daigo Saito proved he was once again the man to beat, piloting his crazy 1000hp JZX100 to its limits once again to take the top spot in qualifying with an insane 125km/h entry over the jump and a total score of 97.00. Naoki Nakamura followed shortly behind, achieving 94.92 points, with yet another mind-blowing attack speed just 2km/h behind Saito. Australian Chris DeJager impressed on his debut in the series, taking third place and Kuwait’s Nasser Almutairi landed one of the best results of his campaign in fourth. Unfortunately for French driver Axel Francois, who had undoubtedly hoped to cause an upset, car failure meant that both he and Nakamura Mike were unable to take part in qualification. It was also an unfortunate weekend for Keiichiro Kadekaru as the driver suffered with wheel-related issues throughout the weekend. After finally hoping it was resolved, it would haunt him once again in an all-Okinawa battle against King of Nations driver Toni ‘Half Breeds’ Arakaki - who progressed to the Top 8. The next upset would be for third place qualifier, Australian Chris DeJager in his Top 16 battle. After impressing throughout his debut and then taking the lead in the opening run against Tatsuya, he would then become the latest unfortunate victim of the wall after a small mistake left him no way out. Despite achieving his highest qualification result and scooping valuable points in the overall series, a mistake from Kuwaiti driver Nasser Almutairi allowed Hirohide Tanaka to land his place in the Top 8. Brazilian driver C Andre Silva would also unfortunately suffer a similar fate against Kouji Tokusa. Both Kenneth and and Jessie Siekert, representing the USA, took their spots in the Top 8 after showcasing some of the best driving we’ve seen from the brothers. As Kenneth went up against Naoki Nakamura, a score advantage would put Naoki through to the semi-finals. Jessie managed to force a one-more-time after a deadlock in his battle, but a costly error saw his car meet the wall, forcing a 10-0 advantage to Tatsuya. Daigo Saito would go up against fellow King of Nations driver Toni ‘Half Breeds’ Arakaki, but Half Breeds’ weekend would be ended early after a costly mistake on the final corner. It would be a similar story for Tokusa in his battle, despite taking a 7-3 advantage in the first battle, a mistake handed Tanaka a 10-0 score to land his place in the semi-final. In the semi-finals, Daigo Saito faced up against an in-form Tanaka. Saito would make absolutely no mistakes once again as he showed why he’s topping the King of Nations series rankings - once again securing his place in the final. As the fans eagerly hoped for a Saito vs Nakamura final once again, Naoki certainly didn't disappoint scooped up the points against Tatsuya to once again face the ultimate test! In the small final, a 7-3 advantage would go to Tanaka in his lead run, and despite Tatsuya managing to grasp a 6-4 advantage in his lead, it wouldn’t be enough – the third spot on the podium goes to Hirohide Tanaka! It was time for the battle that everyone had been waiting for once again. 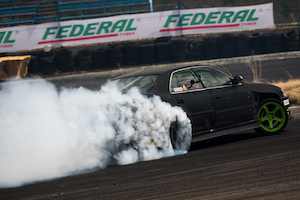 As Daigo led his JZX over the jump in the final using all the power at his disposal, he perhaps pushed too hard as the car landed forcing him into a half-spin leaving him unable to navigate the rest of the layout. With the pressure resting on Nakamura’s shoulders with a 10-0 advantage, desperate to make up for settling for second the previous weekend. It didn’t stop him pushing as hard as he could in his new S15 build. Despite a 6-4 score in Saito’s favour - it was a clear win for Nakamura as he takes his place on the top spot of the podium! This now means that Daigo Saito’s lead at the top of the King of Nations rankings continues, meanwhile Naoki Nakamura continues at the top spot in the King of Asia rankings. Will Naoki Nakamura manage to steal the King of Asia trophy from Daigo Saito at the final round in Malaysia on 8th-9th July?! [4K] 2017 Federal Tyres King of Nations / Asia Ebisu - Japan from King of Nations ProSeries TV on Vimeo.